Click here to view all of our classes. Xanthe Milton aka the Cookie Girl is London's favourite baking teacher, YouTube star and author of ‘Eat Me!’, a top selling cookie and fairy cake recipe book. Cookie Girl was founded by Xanthe Milton, who has gained a cult celebrity in her native London’s Notting Hill and beyond through her unique Fairy Tale. Having been asked many times for her baking techniques she began to offer baking lessons as well as cake decorating classes in London. She has now passed on her cake decorating skills to a hand-picked and personally trained team who will make all classes and parties a memorable occasion. You will be amazed by what you can achieve under best-selling author Xanthes guidance. There will also be plenty of time to have any baking or decorating queries answered whilst you enjoy one of her famous cookies and a cappuccino. 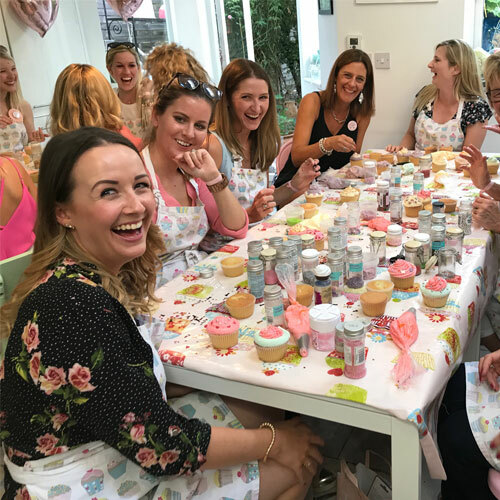 Secure a spot on the popular cake decorating courses in London and you’ll be taught how to pipe to perfection, make flowers from sugar paste and ice with flair using a variety of techniques. Need to deliver a corporate event that is current, different and memorable? Click here to find out more. Sign up with your email address to receive great discounts, news and updates. All you need to do is turn up, drink some bubbly and enjoy yourselves. Find out more.